Hey guys happy Tuesday! I hope that everyone had a great weekend and a Happy Valentines Day! I wanted to let everyone know in case they missed it about the random drops that weer on Saturday 2/14/2015. 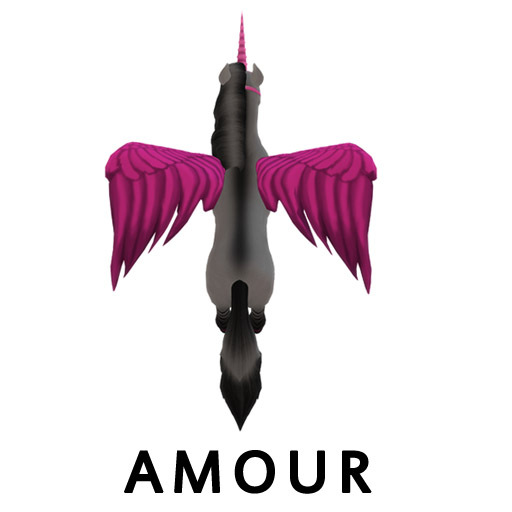 Amaretto wanted to celebrate Valentines day by slipping in some little surprises like the Amour wing! Here is a picture! Anyone breeding horses and receiving bundles on this day had a chance to get this wing! It does have the ability to pass on and matches perfect with the pink bridle and socks!!! If you didn’t get the wing you might have gotten a special eye! All 3 animals had a chance of receiving the Happy Valentines Day 2015 Eye! This eye does have the ability to pass on. I have included pictures of all 3 eyes! Amaretto does hope you had a great Valentines Day! Those Valentines LE. SE. and CE’s are getting older everyday! Keep your eyes out for those surprises!!! This is Ava over and Out!